In this design for 2 town houses in the Sydney inner-city suburb of Newtown, Tony Owen Partners looked for inspiration to the pocket design solutions of Japan. 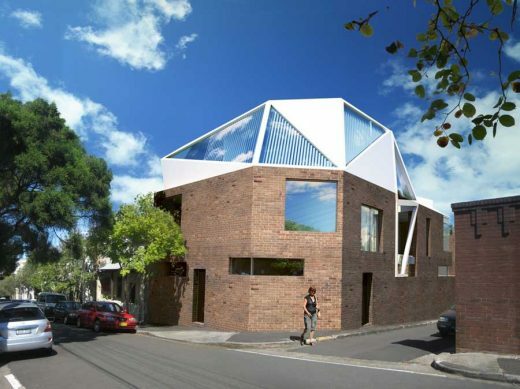 The result; ‘Shiuya-Newtown, is a study of sculptural possibilities on a tight urban sight. The site is located in a dense historic part of Newtown. This area is characterised by close packed 19th century 2-3 storey terrace housing stock and industrial workshops. The existing structure is a 2 storey masonry vernacular industrial structure. This robust expression is in keeping with the character of the area. The solid utilitarian masonry walls have little adornment. The proposal maintains all of the existing external walls and includes light weight additions. These additions form an attic-like loft space, rear courtyards, garage and studios for 2 dwellings. An initial solar study was conducted to map the shadowing of the existing building and conditions. This included impact of existing trees. (see studies). Various massing options were explored and shadow studies conducted to measure impact. In the 3-D model a cutting plane was established based on the line formed where no shadow impact occurs. The cutting plane was used to erode (sculpt) the building massing to ensure no impact on surrounding neighbours and this became the design envelope. The above process resulted in an optimal built form for the site. It was intended that the design maintained the robust utilitarian expression of the existing industrial building whilst maximising the residential amenity. As a result all of the outdoor spaces are internal to the site. A north-facing courtyard has been inserted into both residences. The living and bedroom spaces are directed to the courtyards, which provide light and outlook. The courtyards have a retractable glass roof at ground level to maximise light and space to the dining areas. The L1 circulation space also has a retractable glass wall to create an additional outdoor terrace, add light and ventilation and to open up the rooms between inside and outside. Breaks in the façade to the laneway allow greater penetration of light and ventilation to the courtyards and break up the massing to the street. The rear portion of roof on L2 contains a grassed green roof.